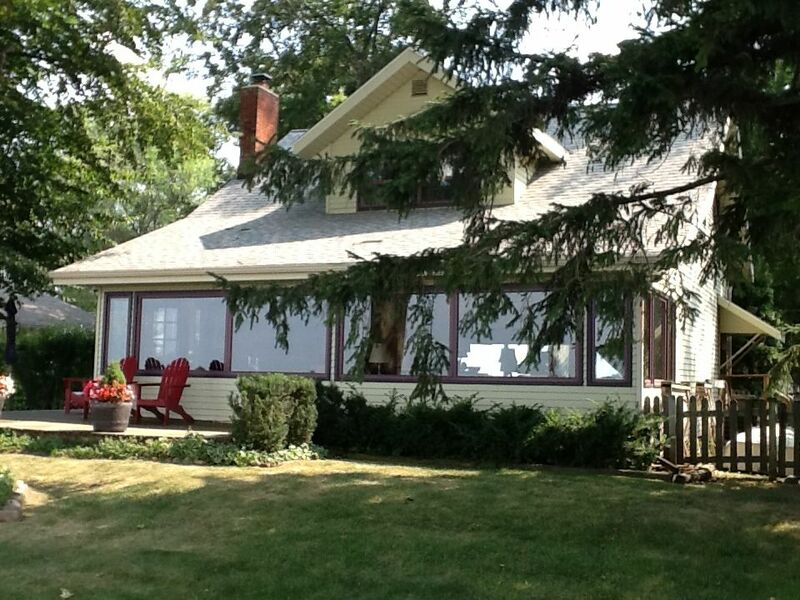 This is a four bedroom, 2 bath cottage that sits right on the water of Crystal Lake. Before you rent anywhere, check the street the property is on. Ours is private and limited traffic. You can dock your boat and not have to worry about 12 other boats on the same dock. Interior upgrades in 2018-19. It’s on the most coveted street on the lake. It's very quiet and because of how the property sits on the lake. There is no seaweed! It's all sand in the water by our dock. Between the panoramic view from the living room next to the stone fireplace to the view from the grill on the deck, this cottage is sure to delight even the hardest of hearts. Although we do not provide a boat, you are welcome to tie yours up. If you want to turn off your cell phone, relax and float away that stress, you've found your summer memory maker-look no further. Sailing on the lake is supported by the Crystal Sailing Club. Established in 1961, the CSC is a family centered working club which supports a Flying Scot fleet. The club is located on the North shore of the lake. The most common classes of sailboats found on the lake are Flying Scots, Sunfish, and some larger cruiser type boats (to about 25'). Public access to Crystal Lake can be made via a DNR boat launch. The best time to view sailing activities are during the Parade of Sails on July 4th, during Flying Scot fleet activities, and during Crystal Sailing Club functions as per their website. The preceeding information was graciously provided by Mr. James Horak, Commodore of the Crystal Sailing Club. For more information on the cottage owner and their story, please click the links below. The current owners consist of five families who use this home as their summer cottage. The current owners grew up going to a country cottage they all called 'The Ranch.' It was very rustic with no indoor plumbing and a wood stove for cooking. The Ranch originally belonged to their great grandfather Mary and James Edward Rowse. Great Grandpa Jim actually traded the store he and Mary owned in Oil City, Michigan for the Ranch which belonged to his cousins. When he passed, it was handed down to his three sons Arnold, Dutch, and Gale. When non-family members used to stay at The Ranch, they were charged $3 for the weekend to help off-set oil and supply costs. People aged and time passed too quickly before family could organize to buy it. The Ranch was sold and children and grandchildren for years longed for those wonderful times that created such good memories. In search of that special place, the current cottage owners camped for years. They were introduced to the Fenwick's, another family on Crystal Lake years ago by the eldest of three brothers, Todd. Danielle, Dane, Chad & Todd were invited to stay with the family every summer along with their spouses and children and did so for years. One sister, and three brothers began to expand their own families and thought it might be time to search for something they could call their own. One day, while staying on the lake, 1 of the 3 brothers, Chad, went for a walk a street over from where they were staying at the Fenwick’s and ran into an older gentleman, Don, that was putting a for sale sign in the yard. The excitement began as Dane & Chad developed a deep relationship with Don. The idea was shared with the rest of the family and soon they all came together to call this their summer cottage. Don wanted to know that his cottage and the memories would continue to be shared. As our Great Grandparents Jim and Mary shared The Ranch with their sons, and our Grandparents Arnold and Evelyn shared it with us to build memories with our families, we share this cottage with you and your family. Crystal Lake is located in eastern Montcalm County. This large Michigan Lake of 760 acres has reported depths of 70 feet. The city of Crystal Michigan is located on the south east shore of the lake. The city is big enough for a grocery store, gas station, and bank and yes a sporting goods store. The first floor bathroom has the shower, toilet room, and washer and dryer in it. Our cottage is located directly on the lake. Our frontage in the lake is sandy, shallow, and a million dollar view. The cottage is equipped with Central Air Conditioning. Central Heat gas forced air. We provide pillows and sheets. We ask that you at least throw bedding in the wash before you leave. Available for use for no extra charge. No parking inside the garage. Yes but you may want to bring beach towels. There is a countertop microwave available for use. It's likely that we have every dish and utensil you may need. Their are at lease three to four different seating areas outside. No bicycles provided but we encourage you to bring yours as a ride around the lake is part of what makes the stay beautiful. No boat is provided but you may inquire at Stone's. Large deck that covers the east side and north side of cottage. The closest golf course is Holland Lake. It's inexpensive, five minutes away, and NOT fancy. The other end of the spectrum would be Buck's Run in Mt. Pleasant. We really enjoyed this cottage. We had 12 people & there was plenty of space for us all to eat, sleep & enjoy ourselves. The lake is sandy bottom and clean. The living area is very open & we had plenty of space to play card games, talk & relax. We plan on coming here again! My family and I enjoyed every minute of our stay. Thanks!! Perfect for Grandma and her children & grandchildren! The cottage was everything and more than we expected. We were delighted with the beautiful view of the lake from the open concept main floor with its multiple seating and table areas, which made indoors living easy and comfortable for our 3 families with children under the age of 8. The cottage came stocked with all the paper products, detergents, trash bags, food staples and condiments we could could have asked for. The 4 bedrooms upstairs were set up just right with beds to accommodate each of the families, and we were grateful for the overhead fans and a/c during the hot nights. The kitchen was more than adequately supplied with dinnerware, cutlery, etc., serving dishes, pots & pans, and even a Happy Birthday banner, candles and party hats, which came in handy as we celebrated 2 birthdays, 3 wedding anniversaries and Grandma's retirement! The dishwasher got regular workouts, which allowed the grown-ups to spend more time outdoors in the beautiful weather. We were so lucky the cottage came with a week of sunshine and perfect swimming weather! We never needed to turn on the fireplace or watch any of the dvds provided. The lake edge seawall with its short ladder was easily maneuvered by our children ages 3-8, and the large swim area is plenty shallow for them to play to the dock-deck and beyond. The cousins lived in the water and took advantage of the many beach noodles and paddle boards found in the storage bins along the deck. Grandma spent many a relaxing hour in the Adirondack deck chairs sipping on... beverages... and watching the little ones show off their swimming skills and listening to their happy squeals. Great-Grandma and Great-Grandpa also enjoyed those chairs when they came to visit one day from their cottage nearby. The men discovered they could rent a pontoon boat from the marina and spent a day pulling the children tubing, after borrowing a tube from their uncle on a nearby lake. The moms were grateful for the stackable washer/dryer so those ice cream and popsicle drips and spills just didn't matter. After driving around the lake and seeing all the other cottages, we all agreed we were extremely lucky to have found such a perfect lakefront cottage for our families to enjoy, and we would rent it again if we could align our travel plans once more from Chicago, Boston, and Vicenza, Italy! Thank you, Owners, for the great fun and relaxing vacation! We had a wonderful and relaxing time staying here. Very clean and well equipped. Great view of the lake. The little guys had lots of shallow water to play in. Every thing went very smooth. Thanks for a wonderful vacation!! This was the perfect house for my family to meet and spend the holiday together. The house is amazing and the lake views from the many windows is beautiful! Felt warm and cozy by the fire with plenty of room for everyone to relax. We enjoyed every minute and I would highly recommend this property. Nice spot on the lake with comfortable accommodations. Everything you could think of was provided. It was a perfect place for a family gathering. We only slept six but we could have had six more in the single beds and bunk beds. We loved the big fireplace inside and the fire pit outside. In the fall, Anderson & Girls Orchards in Stanton is a must see. Uncle Johns Cider Mill & Winery is another great option. Winter-fest is another great experience in addition to ice fishing.